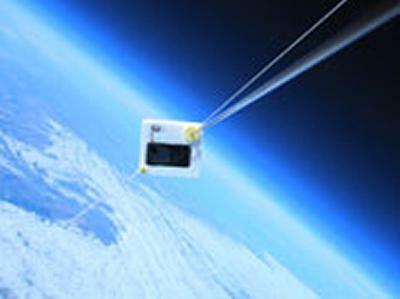 Engineering scientists at the University of Southampton have reached above the clouds in a first-of-its-kind experiment to develop new technologies that probe the stratosphere using an unmanned vehicle. The test flight was part of the ASTRA (Atmospheric Science Through Robotic Aircraft) project, and it demonstrated how a low-cost high altitude platform could be used to send a payload with atmospheric monitoring equipment into the upper atmosphere. The balloon-borne aircraft harnessed the power of ‘cloud computing’ using an on-demand computing and storage resource, via the GSM mobile phone network. Cloud computing refers to the delivery of computing resources and services on demand via the Internet. University scientists worked with Microsoft and University spin-out company Segoz to develop a Windows Phone 7 application for on-board data logging and payload tracking. During the one-hour flight, the phone running the Windows Phone 7 operating system, served as the on-board data logger, tracking tool and communications relay. The phone streamed data to a cloud application built on Windows Azure, designed to continuously update the landing site prediction. The app running on ground-based phones had a ‘tracker mode’ so the ASTRA team were able to track the payload during its flight, over 70,000 feet high, enabling its safe recovery. The flight carried the payload through the tropopause and deep into stratosphere, where the temperature dropped below -50C. The phone and the rest of the equipment was protected by a high-grade foam enclosure (manufactured using a computer-controlled laser cutter at the University’s Engineering Design and Manufacturing Centre). This ensured the reliable operation of the on-board electronics in such extreme environmental conditions.